Drybar Hair Rollers roll easily into hair and stay in place without clips or clamps, then remove gently without pulling or tugging strands. The result is effortless lift just where you want it--at the crown of the head. The secret is the gentle self-grip material that provides strong hold while preventing pulling or damage to hair. 2. Once logged in, click the "Get Offer" button and you'll be directed to the Sephora website to make your purchase. Note: If you're on mobile, scroll down and click on "View Desktop Site" to see the cashback button. 3. Add one (1) Dry Bar High Tops Self-Grip Rollers priced for $10.00 to your cart and shop as you would normally then checkout. If the price changes or anything happens to the stock, the deal is officially over. 4. This is a free shipping over $50 offer. 5. 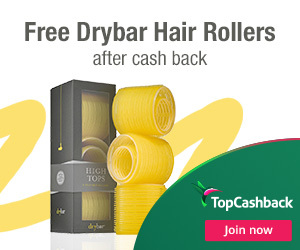 In about 14 days $10.00 cashback will post in your TopCashback account.